The Canossian Daughters of Charity recently bad farewell to long serving companions. Sister Lee was born in Hong Kong on 1 February 1933. On 14 August 1952, four years after her baptism, she joined the Canossians making her first profession in Hong Kong in 1955 and her final profession in Rome in 1961. 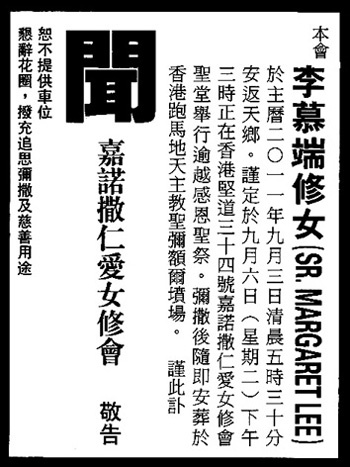 After completing her training and studies in education, she taught at St. Mary’s Canossian School, Tsimshatsui, and the Canossian Convent School, Shaukeiwan. In 1965 she became the principal of Sacred Heart Canossian Primary School, Caine Road. In 1973, she was appointed to head the Holy Family Canossian College until February 1979, when she was nominated as a provincial councillor. She returned to Holy Family in 1985 as superior of the community and principal of the college. From 1988 to 1991, she went to Oxley, Australia, for study and pastoral services. She returned to Hong Kong in 1991 and served as superior and administrator of the Honeyville Canossian Retreat House, Pokfulam. In her final years, Sister Lee lived bravely with her illness. The Canossian Sisters thank the readers, relatives and friends for their prayers for the repose of their souls. May they rest in peace.